If you’re from around here, you know everything about the semi-annual antiques week that draws crowds of thousands every six months to Round Top and the surrounding areas. But if there’s a chance you’ve never heard of what some refer to as “the biggest treasure hunt in Texas,” you’ve come to the right place to learn about the history and lasting influence of Round Top antiques week. In the 1960s, wealthy Houstonians began to buy and restore historic properties in and around Fayette County, looking for an escape from bustling city life. As the new owners filled their weekend homes with European antiques, society women Ima Hogg, Faith Bybee and Hazel Ledbetter became concerned with preserving the legacy of fine Texas and American furniture and art. They approached Emma Lee Turney – a successful antiques dealer herself – with an idea. And with that, Round Top antiques week was born. The first Antiques Fair was held in Round Top in October of 1968, with around 25 vendors set up at the Rifle Hall. Antiques collectors came from far and wide to shop, bargain, and socialize. With the help of Hogg, Bybee and Ledbetter, who encouraged their friends to attend, the fair was a massive success. So successful that Turney decided to make it an annual event – adding tents outside of the Rifle Hall until the huge crowds and eager antiques dealers outgrew the space. The fair expanded to the Carmine Dance Hall and the fields in Warrenton that line Highway 237. Turney eventually purchased land on Highway 237 five miles north of Round Top and built the Big Red Barn, which is still the home of the Original Round Top Antiques Fair. 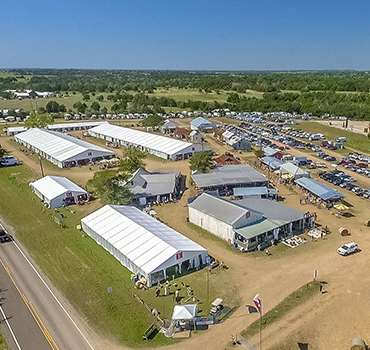 Today, Round Top antiques week draws crowds of about 200,000 to the over 5,000 antiques vendors that line the highway and pack the surrounding buildings twice a year. This fall’s antique show takes place from September 20th – October 8th, and a valuable piece of Texas history awaits. All treasure hunters are welcome!